Student EMT’s practice first aid. If you need medical attention on a weekend at Macalester, there’s one campus organization that’s likely to reach you first: Macalester College Emergency Medical Service (MCEMS). 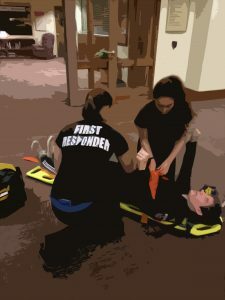 An extension of Mac First Aid, the organization provides students with medical knowledge and training, in addition to hands-on experience as members of a regular emergency response team. “We’re there for when that kid down the hall had too much to drink and passed out, or if someone in your hall is having a panic attack and you don’t know what to do – things like that,” Clara Motiño ’19, MCEMS president, said. Between 7 p.m. and 3 a.m. every Friday and Saturday night, at least two of the student org’s 32 active members are on call in the Campus Center, ready to respond to medical emergencies alongside campus security. A group is also always on standby at events like Winter Ball, Founders Day and Springfest. MCEMS members, many of whom also study pre-med, are well-prepared for the task. They’re required to complete 150 hours of EMT training in addition to earning certification from the National Registry of Emergency Medical Service personnel and the state of Minnesota. Students can work towards meeting these requirements by registering for Macalester’s annual J-term EMT course. “It took a lot more effort and time commitment than my other classes here at Macalester,” Saskia Sackner-Bernstein ’21, who completed the EMT course this past January, said. “We were basically working from nine to five every day. It was very intense, very difficult, very accelerated, but I definitely learned a lot in a short amount of time.” In addition to its EMT course, MCEMS offers students CPR training. With a fire station just blocks from campus, members recognize that it might seem redundant to have students on call for emergency response as well. If MCEMS is called to help an intoxicated student, those involved will likely have follow-up meetings with an RHD, but won’t be subject to formal disciplinary action. This way, students can call for help without having to worry about being punished. Motiño is adamant that MCEMS should not be considered a replacement for calling 911. “We act as a filter for St. Paul Fire by assessing and deciding whether or not the situation is life-threatening,” she said. If MCEMS members have anything in common, it’s a desire to learn valuable medical skills combined with a passion for helping fellow students. “Being a part of MCEMS has been a window into the future that I want to have” Motiño said. “It’s a constant reminder that I am doing what I’m supposed to do and that I really am working towards a rewarding and giving goal.